An article in Danish about the Møgelmose find (from 1857) and the other older iron age skin-garments found in Denmark. The dating is a bit uncertain since it was done on already conserved material, but the author think around 200 AD being the most likely data (the younger of the two carbon datings made in 1987). The garment type most commonly made of skin in the iron age is the "slag" (raincover/poncho) of which the Møgelmose find belongs, yet the Møgelmose find is unique, since the skin is marten, whereas the bulk of Danish finds are of lam or sheep (+goat ?) skin. Another unique find was made of deer. Overall find number from Denmark: 9 skin "slag" are dated to the Iron Age, with another 11 un-dated, but most likely also from the Iron Age. The were worn by both men, women and children. In lot of medieval European cultures the wearing of leather clothing and animal skins is considered barbaric and only done by the lowest on the social-economical scale. The main exceptions seem to be waterproof ponchos for wearing in the rain and rare animal furs for the wealthy. Any idea about the tannage? Dan Howard, your point here is at odds with several points you have made previously. I cite my own first topic on this forum, and many others, where you have criticised the idea/concept of wearing leather armour/clothing based on the high cost.. and the only concession granted being that 'if it existed' it would be worn solely by those of "high socio-economic position".. I could attach screenshot photos of your past comments (available on Search), though that would be vulgar, and not really acceptable on this forum. I am, therefore, genuinely asking you.. What changed your opinion, and/or what evidence supports your claim? This is a topic I am genuinely interested in! In mediavel Hungary two or more light leather kaftans worn on each other were a common armour among the light cavalry units. (f.e. Villani Chronicles about the Neaple wars of Louise of Anjou). I guess not only they used it. Later times the leather coats got more common in other parts of Europe, too. And how can someone tell from a scipt, exactly how "barbaric" a piece of cloth made of leather looked like? In mediavel Hungary two or more light leather kaftans worn on each other were a common armour among the light cavalry units. (f.e. Villani Chronicles about the Neaple wars of Louise of Anjou). IIRC, Villani calls them "doublets"
You can tell by reading hundreds of texts and noting the common themes. Negative attitudes to hide clothing comes through very strongly - especially in Germany and France. They even thought that leather bottles were barbaric; the French used to joke that the English drank out of their boots. It could also mean barbaric fashion. Fe. trousers, boots, but that is not the point. Weather proof- leather was used for tents and for clothes from the paleolit times. Doublets: do you mean the stripes glued togethet with tar? Because I don't. It helps if you go to the original language. Villani describes them as farsetti di cordovano.. It translates as "doublets of cordovan leather". It could also mean barbaric fashion. Fe. trousers, boots, but that is not the point. Weather proof- leather was used for tents and for clothes from the paleolit times..
Just because a culture had one item from leather, doesn't mean that they made use of other items made from it. For example, the French made boots, belts, and weatherproof ponchos from leather but considered leather clothing uncouth - fit only to be worn by wild men. And just because Hungarians wore leather clothing doesn't mean that Scandinavians did so too. 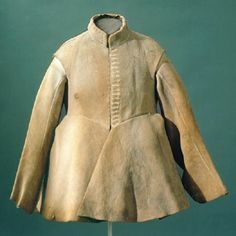 If you want to build a case for a particular culture wearing leather clothing then you actually have to find some kind of historical precedent for that particular culture in the time period in question. Cost and availability are irrelevant. It is purely a cultural convention. The Franks used to mock the Langobards for wearing white wrappings on their legs. The French used to mock the English for drinking from leather bottles.Today, head scarves are considered polite and respectful in some cultures while in others they represent female repression. Fashion is bizarre, fickle, and often irrational. My mother was a strict Catholic and when she was younger she wore a head scarf in public. By the time I was a teenager she stopped doing it. Look at American photos from the first half of last century. Almost every person is wearing a hat. In this century hardly anyone wears a hat. Even if a culture made use of leather armour on the battlefield and their blacksmiths wore leather aprons at work, doesn't mean that leather clothing would be tolerated in civilian society. The garment in question isn't medieval and may date from 200 B. C. If it's from around that date I doubt that anyone in Scandinavia was worried about making a fashion statement as much as they were trying not to freeze to death. Denmark is not exactly the high arctic, even in the cool and wet iron age. Only if forced to sleep outside in wintertime are you in danger of dying of cold. Dying of pneumonia after getting wet and cold is a much more likely way to die. Denmark was very wet in the Iron Age. If you are in danger of freezing to death, then you are among the poorest in society. People of income do have houses/halls and access to timber and will always try to display wealth and status through clothing. I think that is more or less the norm in all human cultures, no matter where on earth. From bronze age oak-coffin burials and iron age bog mummies found in Denmark, it is very clear that Scandinavian people were very focused on fashion, as they also were in the viking age and medieval period. Clothing made of skin were acceptable in the Iron Ages, but almost all are capes (symmetric or asymmetric = poncho's), caps and belts. So a class of "over-garments" and accessories. 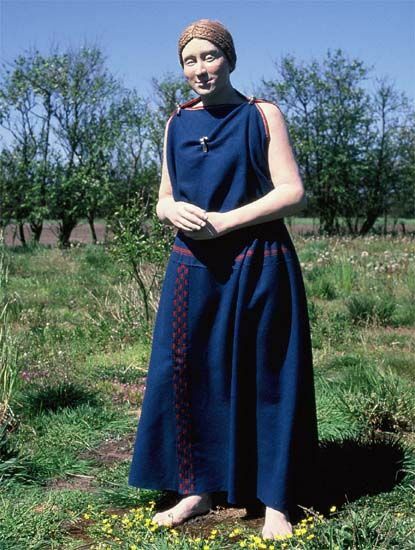 The Møgelmose find is the only dress with sleeves (so technically a tunic) - a Roman fashion inspiration. Also a reason why 200 AD is a likely age for this find. This following is only my personal opinion: When you see the bulk of the finds in the early Iron Age, it is likely that it was used up here as a "over-garment" rather than undergarment. If choosing "Roman fashion" and have the tunic made of marten skin, it was likely for "show" and not to be hidden away as an under-garment covered by capes. Likely it was used as a rain/wind-cover and signal "roman" ties. Many warriors in the modern Danish area were auxilla soldiers in the Roman army and returned home, possibly when they had earned enough to buy their own farm, getting married and raise a family. They off course brought roman ideas and items home. Research shows that dyed clothing started in Denmark already 500 BC - the transition from Bronze Age to Iron Age. Scandinavian men and women were apparently inspired by Roman fashion in the "Roman Iron age", but didn't always copy it directly. For instance the women had dresses with bare arms (which were not acceptable for honourable roman women). (Above) Reconstruction of the dress from Lønne Hede. Yellow colouring was most common, whereas you also see red and blue pieces of clothing (more high status than yellow?). Choice of red and blue likely signal good social standing (the clothes are not imported, but made locally). "And it's no use for thee to hide thy name, thou in the bearskin," said he." Þar fengu þeir skip er Þórður átti, fara nú leiðar sinnar, koma til þings þá er flestir voru áður komnir, ganga til búðar Ólafs pá úr Hjarðarholti. Bersi var hans þingmaður. Fjölmennt var í búðinni og fékkst Bersa ekki rúm. Hann var vanur að sitja hjá Þórði. Það rúm var skipað. Þar sat maður mikill og sterklegur í bjarnskinnsúlpu og gríma fyrir andliti. Bersi stóð fyrir honum og gafst eigi rúmið. Bersi spyr þenna mann að nafni. Honum er sagt að hann heitir ýmist Glúmur eða Skúma. "Og er þér ekki að leyna nafni þínu bjarnúlpumaður," segir Bersi. Can anyone tell me if the Icelandic version actually says bear-skin coat, or is it a bear-skin cloak? The meaning of olpa (úlpa) in bjarnskinnsulpa means "over-garment", cape or cloak. The english translation you found as "coat" is a little bit misleading. A coat is an overgarment, but has sleeves, which a cape or cloak doesn't have. The olpa is most likely sleeve-less. Niels, thank you for that translation. That was the only bearskin coat I've found in the sagas. Haven't read them all. There is one mention of a bearskin kirtle in England. When Othere visited King Alfred, he listed a bearskin or otterskin kirtle as tribute to the norse from the Lapps. Here under Biography https://en.wikipedia.org/wiki/Ohthere_of_H%C3%A5logaland In anglo-saxon it's berenne kyrtel. The specific mention of bear- and wolf-skins are very much connected with (ecstatic) warriors connected with Odin and being in a "comitatus" (martial brotherhood) around Kings and Jarls. A Berserkr [= "Bear-sark"] can be a lonesome warrior or in groups, whereas an Ulfheðinn [= Wolf-skin(cape)] would generally be part of a pack. Often reported as being in groups of 12. Donning a skin was seen as a way to change one's physical form (the "Hamr") -> here one should probably think of a untreated skin with fur and possible head and feet still attached. So it was believed you turned into the animal and got its power(s). In the sagas (those written in christian times) the berserkir have become the "hooligans" of the stories, generally portrayed very negatively. Perhaps they were even so in pagan times, as Odin likely wasn't to popular among the common people. So these bear- and wolf-skins are not actually "clothing", but a means of shape changing; also sends a very pagan signal. It's something you don when going to battle (also seen during "initiations" - as in the Völsung-saga, where Sigmund and Sinfjötli dons wolf-skins and turn into wolves). Egill Skallagrímsson's paternal grandfather Úlfr Bjálfason was called "Kveldúlfr" as it was said about him, that he turned into a wolf in the evening and night. He must certainly be regarded as a Ulfheðinn and from one of the very few families on Iceland with clear ties to Odin. Rage, honour, poetry, use of runes and punishing people for not showing hospitality are certainly what both Odin and Egill stands for. 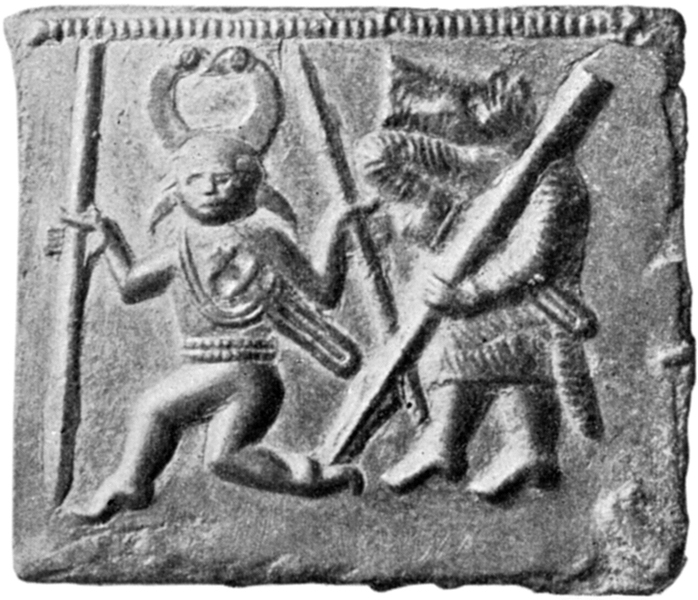 In the Iron Age you have the Torslunda helmet plaque (Öland) and the Gutenstein foil, which both shows a dancing (?) figure with a helmet with birds (eagles?) as horns and holding two spears, and one or two men (?) dressed as wolves.